Accuracy testing was set to be completed on Monday morning after press time by the Polk County Board of Elections for another round of voting as run-off elections are set for Tuesday, December 4. Ballots are being cast soon in a forthcoming race between Republican Brad Raffensperger and Democrat John Barrow in the continued race on who will in 2019 be the new Secretary of State for Georgia after Brian Kemp resigned earlier in the month to start the transition to being the new Governor. That came only after court wrangling from Democratic candidate Stacey Abrams over ballots in Gwinnett County, and a concession before the Thanksgiving holiday. Now interim Secretary of State Robyn Crittenden holds the job, and she'll remain through the end of the year after the election decides who takes over the position. Georgia Public Service Commission's District 3 race also was close, with no candidates getting 50 percent plus one to win. Incumbent Republican Chuck Eaton will face Democratic challenger Lindy Miller in the Dec. 4 race as well. No local questions are on this ballot, and those who want to return to vote will need to contact the Polk County Board of Elections for more starting on Monday at 770-749-2103 to learn more about voting in the forthcoming race. Besides the statewide race and the regional one for Public Service Commission, the only other election news happening in the region surrounds the race over who will take over the county lines in Floyd and Bartow. Four candidates qualified by the deadline last week on Nov. 21 to seek the state House District 14 seat vacated by Christian Coomer. • Nathan Wilson, owner of Wilson Contracting Co. in Cartersville. The district covers the southeast corner of Floyd County and the northern half of Bartow, with about two-thirds of the voters living in Bartow. All four candidates qualified as Republicans. Voters in the district must have registered by Nov. 27 in order to vote in the special election, which is aimed at trying to fill the seat before the Georgia General Assembly session starts at 10 a.m. on Jan. 14. A candidate must pull more than 50 percent of the vote to win outright. If a run-off is necessary, it will be held Jan. 15. Christian Coomer, a Republican, was unopposed for re-election but withdrew his name Oct. 31 when he was sworn in by Gov. Nathan Deal as a judge on the Georgia Court of Appeals. It was too late to change the ballots for the Nov. 6 general election but votes for him were not counted. The upcoming election is billed as a special Republican primary. Robert Brady, chief elections clerk for Floyd County, said state law requires a new primary since the single candidate did not make it to the general election. Any registered voter in the district will be able to participate even if they didn't vote in the earlier primary. Georgians don't register by party, so those who chose a Democratic ballot in May are also free to vote in the upcoming Republican contest. One of the biggest problems a small business owner can face is the cost of covering themselves and employees with health insurance. Large companies and local governments have some ability with the help of businesses like ShawHankins to bring those costs down, but in the case of an employer who might only have ten people on staff or less, that negotiating power is lessened since they aren't spending large amounts for premiums annually. Now there's a new option for small businesses who are looking for affordable health care options with the same coverage level offered to larger organizations. The Polk County Chamber of Commerce is bringing ShawHankins to the Richardson Field Depot on Tuesday, December 4 for a breakfast meeting to discuss this new SMART option, or the Small Group Employer ASO Rated Trust plan. Chamber Executive Director Blair Elrod said it was an initiative put together by the Georgia Chamber of Commerce and Blue Cross-Blue Shield through their Anthem coverage to allow small businesses from two to 50 employees to work as one large group plan. "When small businesses go to get insurance, it's at an astronomical cost and sometimes can't afford it," she said. "Now there's going to be an option where our small businesses can enroll in healthcare that is more affordable, and have their coverage be part of a larger pool where the risk is shared statewide." The Dec. 4 breakfast meeting is set to start at 8 a.m. and last an hour and half, with breakfast provided by Chick-fil-A. "All of our small businesses locally can come and hear about the plan and see if it is something they are interested in taking part in," Elrod said. The new plan will be selffunded from participants to spread the risk out, Elrod explained. She said as well the plans will be flexible and provide predictable, fixed monthly payments for businesses as well for premiums. ShawHankins said in a promotion for the new plan that it could provide as much as 40 percent lower rates than current ACA rates. Elrod said additionally dental, vision, life and disability insurance are among the options available for those who want to participate as well at discounted rates via the Chamber's SMART Plan. There are some stipulations for taking part. Employers interested in the shared coverage can have no more than 50 on staff, and have to be headquartered and operating in Georgia. Additionally, they have to be good members in standing with dues paid to the Chamber of Commerce. Elrod said the plan is also being presented to businesses locally in Paulding, Floyd and Bartow counties. Anyone wanting more information can contact Elrod ahead of the meeting by e-mail at director@polkgeorgia.com, or call 678-883-9255. The news came in just before the Thanksgiving holidays, and this time those in the western edge of Cedartown should be on alert about the potential for the disease cause harm to their pets or loved ones. Polk County's third confirmed animal-rabies case this year, a raccoon, had public health officials last week cautioning residents once again the potential dangers of the virus. The department urges pet owners to make sure their furry friends are vaccinated against rabies, and additionally warn residents in the densely populated downtown area around E. Girard Avenue, North Main Street, and in the suburban residential area around Prior Station Road, where the cases have been found to be especially observant and cautious. "You can´t tell if an animal has rabies by just looking at it. A clue, though, is if the animal is acting strangely, says the Polk County Health Department's Environmental Health Manager Kathy Couey-Miller. "The best thing to do is to never feed or approach a wild animal. Be careful of pets that you do not know. If you see a stray dog or cat, don't pet it, and if any animal is acting strangely, call your local animal control officer for help." Polk's first 2018 rabies case, a raccoon, was confirmed back in March. Another case, also a raccoon, was confirmed in September. Polk County had three animal rabies cases in 2017, all of which were raccoons, and nine cases in 2016 – eight raccoons and a bat. Officials emphasize animal rabies can be found throughout Polk County. "Rabies is regularly found in Polk County and is always circulating in our wild animal population," says Couey-Miller. She cautions residents to avoid wild, stray, and possibly unvaccinated animals that may be infected with rabies and emphasizes residents should take additional precautions to protect themselves, their families, and their pets. "Getting your pet vaccinated against rabies is the single best way to protect your family from rabies," CoueyMiller says. "It's important to do it for their protection, for our protection, and because it's state law." • Vaccinate all dogs, cats and ferrets against rabies. Check with your veterinarian to make sure your pets have up-to-date protection against rabies. Remember that the vaccination of pets against rabies protects not only the pets, but more importantly, protects people. • Don't leave pet food out where wild animals can access it. Leaving pet food out is a sure way of getting wild animals to visit your home endangering you, your family and your pets. stray or wild animals. These animals may be infected with rabies. • Small children should not be left unattended with dogs, even if the dog is a pet or the child is familiar with it. • Keep pets at home. Obey any county laws requiring that dogs be restrained to the owner's property. Pets that are kept close to home are less likely to encounter a rabid animal. • Report any raccoon, fox, bat or skunk that is out during the day in a residential area or that is behaving strangely to the local Georgia Department of Natural Resources Game and Fish Division office at 1-800-241-4113. • Report stray dogs and cats and aggressive or sickappearing animals to the local animal-control office. • Don't attempt to assist injured or sick animals without professional help. Even animals which would never bite otherwise can bite when sick or in pain. • Bats found in sleeping quarters should be captured and tested for rabies even when there is no evidence of a bite wound or contact with the sleeping individuals. • After-hours calls involving aggressive animals should be directed to 911. • After-hours calls involving animal bites and their potential for rabies exposure should be directed to 866-PUBHLTH (866-782-4584). Polk County residents can contact the Polk County Health Department's Environmental Health Office in Cedartown at 770-749-2253 for additional information or with any questions or concerns. Residents can also visit the Northwest Georgia Public Health website at https://nwgapublichealth.org/environmental-health/rabies for information on animal rabies and rabies precautions. Residents can also visit http://www.cdc.gov/rabies/for comprehensive rabies information. Craftsy House hosted a Grinch-themed, holiday-inspired painting party over the weekend for Small Business Saturday in Cedartown, joining other businesses who opened for the day to celebrate buying and creating local products. Craftsy House is taking part in this weekend's Downtown Holiday Open House in Cedartown as well, and plans to have a special visitor on hand. Workers for the City of Rockmart spent hours putting up the Christmas tree in front of the Rockmart History Museum on Thursday, Nov. 15 well ahead of the annual Christmas tree lighting taking place at the end of the annual parade down Marble Street happening on Friday, Dec. 7. Cedarstream were the first have their tree trimmed for the holiday decorating contest taking place in Cedartown for the month of December. Participants must have their trees out in designated spots and entry forms completed by Nov. 30. This weekend will be a big one of events in Polk County, with trees trimmed and carols to be sung, gifts still to be bought and so much more going on that it can keep one's head spinning with all the action afoot. Starting this Friday and continuing through the next couple of weeks, the holidays will officially be ushered in across Cedartown and Rockmart and Santa Claus even has some visits planned for the near future. So young ones who haven't completed their wish lists to Ol' Saint Nick and sent them into the Standard Journal, don't forget the deadline is this coming Monday, Dec. 3 to get them postmarked and off to be published in the paper. Don't miss the chance to get the word to Santa when he gets his copy of the print edition at the North Pole. In the meantime, get mom and dad to head to downtown Cedartown this Friday night for the start of the Christmas season. Cedartown's Christmas Open House is set to begin on Nov. 30, with various seasonal festivities set to last until 8 p.m. at the park on the corner of Main and Ware Street. The Christmas tree lighting is slated for 6:30 p.m., Lime Branch Baptist Church will be performing the Nativity Scene live from 6 through 8 p.m., and First United Methodist Church and the Lime Branch Baptist Church choirs will be performing hymns at 6 p.m. The various retail stores and eateries of downtown Cedartown plan to extend their hours to 8 p.m. during the events, and certain open house events will continue on Saturday, December 1 during normal business hours and Sunday Dec. 2 from 1 through 5 p.m.
Cedartown's Performing Arts Center is also hosting "Elf Jr. The Musical" this weekend starting with a Friday evening performance starting after the Christmas tree lighting at 7 p.m., and an encore this Saturday from 2:30 to 4:30 p.m. Tickets are $10 in advance and $12 at the door. Also planned this weekend in Rockmart is another big event for the holiday season, one filled with the music of love for the holiday season and the savior of the world. "O Holy Night" is the theme for a lot of things in Rockmart this year, starting with the Rockmart Community Chorus' Annual Christmas Concert. It's coming up on Saturday night, Dec. 1 at The Rockmart Theatre starting at 7 p.m., and with an encore matinee being held this Sunday, Dec. 2 at 2 p.m.
for the Rockmart Cultural Arts Center Gallery exhibit through December 22 featuring Susan Waters' life size Nativity sculptures, still on display at the gallery located in the Rockmart City Hall complex on Piedmont Avenue. 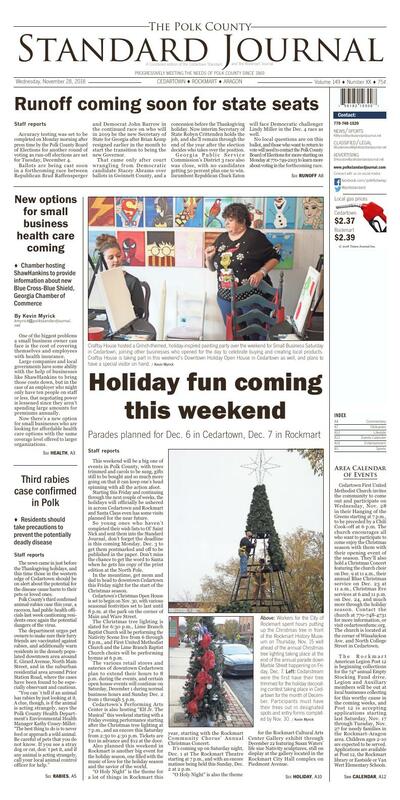 Then of course there's the upcoming Christmas parades in both the cities of Cedartown and Rockmart. Cedartown's Main Street will close down on Thursday, Dec. 6 for their 6 p.m. parade, with the theme this year focused a "Blue Christmas" downtown. The City of Cedartown encourages residents, businesses, schools, industries and churches to participate in this year's Christmas Parade. The theme for this year's parade is "Blue Christmas." Groups wishing to be eligible for prize money for best float must stick to the blue Christmas theme. "Folks can get creative using blue lights, blue ornaments, blue trees or stockings, tinsel and balloons. The key is to use the color blue as a major theme for your float design," explained Aimee Madden, Christmas Parade Committee member. Contact City Hall at 770-7483220 by the end of this week to learn more about participating in the Cedartown Christmas parade. Businesses will be open late in Rockmart for people's dining and shopping pleasure on Friday December 7 for Rockmart's "O Holy Night" Christmas parade on the following night. Immediately following the parade, the Rockmart Fire Department will stop with Santa Claus at the Rockmart History Museum to light the Rockmart Christmas Tree and meet with kids of all ages. The Rockmart Community Chorus will be singing carols at the Tree lighting too. Come to the parade, check out the stores in downtown Rockmart, and enjoy the Christmas comedy, "Christmas Belles" afterwards at The Rockmart Theatre at 7:30 pm. Tickets for the play are $10 at the door. Cedartown First United Methodist Church invites the community to come out and participate on Wednesday, Nov. 28 in their Hanging of the Greens starting at 7 p.m., to be preceded by a Chili Cook-off at 6 p.m. The church encourages all who want to participate to come enjoy the Christmas season with them with their opening event of the season. They'll also hold a Christmas Concert featuring the church choir on Dec. 9 at 11 a.m., their annual Blue Christmas service on Dec. 23 at 11 a.m., Christmas Eve services at 6 and 11 p.m. on Dec. 24, and much more through the holiday season. Contact the church at 770-748-4731 for more information, or visit cedartownfumc.org. The church is located at the corner of Wissahickon Ave. and North College Street in Cedartown. The Rockmart American Legion Post 12 is beginning collections for the 74th annual Empty Stocking Fund drive. Legion and Auxiliary members will be out at local businesses collecting for this worthy cause in the coming weeks, and Post 12 is accepting applications starting last Saturday, Nov. 17 through Tuesday, Nov. 27 for needy families in the Rockmart-Aragon area. Children ages 2-10 are expected to be served. Applications are available at Post 12, the Rockmart library or Eastside or Van Wert Elementary Schools. The Polk County Chamber of Commerce and South Marble Coffee in Rockmart are teaming up for a Christmas reading event on Saturday, Dec. 15 from 12 p.m. to 2 p.m. Join in the fun for a reading from "The 12 Days of Christmas in Georgia" by author Susan Rosson Spain at the coffee shop at 212 S. Marble St., Rockmart. The first 100 children who come to the event get a free copy of the book, provided by Oglethorpe Power. Contact Chamber Director Blair Elrod for more at director@polkgeorgia.com. The First Baptist Church of Cedartown will hold a candlelight service on Sunday, Dec. 16, 2018 in their sanctuary featuring the choir and ensemble. All are welcome to join in worship at the church located at 101 N. College St., Cedartown. Call 770-748-3120 for more information. Starting last week and continuing through Dec. 17, Rockmart First United Methodist continues their "Surviving the Holidays" grief group held on Monday nights at 7 p.m. Invite friends to share feelings of loss with those who understand how hard this time of year can be. The program is being facilitated by Rev. Martha Dye. Call 770-684-6251 for more information. Need help with the bills during the winter, and are a senior? Tallatoona CAP will begin accepting appointments for the Low Income Home Energy Assistance Program (LIHEAP) for Senior Households 65 & older and Homebound Households. Appointments for the General Public will be accepted beginning in December. Appointments are provided on a first come first served basis until funds are exhausted. Polk County residents who qualify will receive either $310.00 or $350.00 toward their heating bill (heating source). To schedule an appointment or to request a homebound appointment, visit our website at www.tallatoonacap.org and click BookNow, or call 770-817-4666. The Polk County Democratic Committee Meets on the second Saturday of every month at 9:30 a.m. In the "even" months (February, April, June, August, etc.) the organization meets at The Rockmart Library at 316 N. Piedmont Ave., Rockmart and during the "odd" months (January, March, etc.) they meet at the Cedartown Welcome Center, 609 Main St., Cedartown, GA 30125. The Care Giver's Support Group is being formed for support for care givers in the Rockmart and Aragon communities. The first meeting to determine interest is coming up on Monday, Nov. 26 at 11 a.m. Patsy Wade, the Bereavement Coordinator for Heyman HospiceCare will be leading the group. In her role she provides community resources, grief support, and education. The location for the group is at Rockmart Presbyterian Church, 306 S. Marble Street, Rockmart. Call the church to learn more at 770-684-7289. USAPA Pickelball Ambassador Daneen England is holding a free pickleball clinic every Monday (weather permitting) from 6:30 to 7:30 p.m. at the Rockmart Tennis courts, located at 436 Hogue Avenue, Rockmart. Loaner paddles and all necessary equipment will be on hand to learn t he sport. This is a free event for anyone and they just need to wear comfortable gym clothes and tennis shoes. Contact England at 770356-1282, or by e-mail at howardd999@yahoo.com for more information. The American Legion in Rockmart is hosting their monthly all-you-caneat spaghetti dinner on Wednesday, Dec. 12. Meal of spaghetti, meatballs, garlic toast and salad, $5. Join the group for a good meal and to support veteran and children's programs. The Legion is located at 1 Veterans Circle, Rockmart. Christmas Back Home is coming to Cedartown on Saturday, Dec. 22 from 7 to 9 p.m. at the Cedartown Performing Arts Center. Tickets are $15 for general admission, and $20 at the door for the event, featuring Scott Thompson, Brent McDonald and Friends. ticket sales going to the food pantry and clothing program at Cedartown Middle School. Students from the Middle school will also be part of the preshow festivities including, singing, musicians and drama. The ticket purchase code is "CMS27," and can be purchased at www.christmasbackhome.com. Rockmart Presbyterian Church is pleased to announce the expansion of its Music Ministry. First welcome Paul Campbell BM,MM,BD as Music Director and Organist, second the New Allen Organ in the Chancel and third, new program opportunities. The adult choir is accepting new members in preparation for its Christmas Eve program featuring "Christus Natus Est" by Cecilia McDonald. Sectional rehearsal are scheduled through the week. A new children's program includes Children's Choir on Wednesdays at 4 p.m. (FREE and open to all who wish their children to learn to sing). There will be an orientation meeting for parents and children on October 10 at 4 p.m. In addition to directing the new children's choir, Mr. Campbell will be offering Piano Lessons along with Shellee Wilson BM, BA, ME, will be offering singing/vocal lessons. Private lessons have a monthly fee. For information to joining our music program please stop in and see Paul Campbell at Rockmart Presbyterian or call him at: 404-312-7801. Do you have interest in studying the Bible and prophecies within? Contact Dr. Idel Suarez about a new study group being formed locally for serious scholars of the text. Contact him at 813-310-9350 for more information about how to participate and future meetings. Celebrate Recovery meets every Monday night at the First Baptist Church of Rockmart starting with dinner at 6 p.m. to 6:45 p.m. Large Group at 7 p.m. and Small Share Group at 8 p.m. The office of Exceptional Students of Polk School District is available to assist with the identification of children with disabilities and provision a free appropriate public education beginning at the age of three through the age of 21. If you suspect your child is experiencing any developmental delay or you suspect your child might have a disability and would like assistance or for more information about services available through Polk School District, contact the PSD Exceptional Student Services office at 770-684-8718. Aragon First United Methodist Church offers a food pantry for the community to use if they need assistance. They are open Mondays from 5:30 to 7 p.m. and Tuesday mornings from 9 a.m. to 11 a.m. A picture ID is required to participate. Call 770-684-4855 for more information. Rockmart First United Methodist Church invites the community to come out and join in worship on Sundays and Wednesdays at the church located at 135 W. Church St. Sunday morning worship begins with Bible study at 9:45 a.m., followed by Sunday school at 10 a.m. for all ages, and an 11 a.m. worship service. Wednesday night includes at 5 p.m. community meal on the last Wednesday of every month, 6 p.m. Bible study and choir practice at 7 p.m. Weekly children's events at the church include a 5:45 p.m. children and youth meal, 6:15 Children's music and MYF, followed by L.I.F.E. at 6:54 p.m. All are invited to join in. Call Rev. Martha Dye at 770-684-6251or e-mail marthadye@ngumc.net for more information or questions. The church also updates weekly on their website at rockmartumc.org. The next West Georgia Spay/Neuter Clinic is coming to the Cedartown-Polk County Humane Society again coming up this Wednesday, Oct. 24, 2018. Head over to the organization's office at 608 Adamson Road, Cedartown, on Fridays from 4 to 7 p.m. or Saturdays from 10 a.m. to 1 p.m. to fill out an admission and prepay for the surgery. Those wanting more information can call 678-361-7304 for more information. Vaccines and tests are available for extra cost as well. Transports won't be scheduled again until Nov. 7. Members are invited to join the Cedartown Exchange Club weekly on Thursdays at 6 p.m. at the Cherokee Country Club for meetings and dinner. New members from across Polk County are encouraged to get involved by contacting club president-elect Edward Guzman at 770-546-2482 to take part in the organization that is involved in a wide range of community projects. Visit their website at cedartownexchangeclub.com to learn more. Annual dues are required to be a member. Just Us Ministries Inc. Food Bank has distribution every Tuesday and Thursday at 904 Young Farms Road in Cedartown. On Tuesday the distribution is from 10 a.m. to 2 p.m., and on Thursdays from 10 a.m. to noon. A picture ID is required. For more information call 770-687-1009 or 678-901-3354, e-mail justusmin.org@gmail.com, or visit Justusministries.com. Harmony Baptist Church, 882 Little Harmony Rd, Cedartown (Esom Hill area) invites everyone to attend their weekly Sunday morning Services. First Sunday morning service begins at 9:45 a.m. with Sunday School followed by worship service at 11 a.m.. Our doors are open to all and we are looking forward to seeing you. For more information visit our Facebook page, Harmony Baptist church, Cedartown. The Rotary Club of Polk County meets weekly at the Richardson Field Depot in Rockmart for lunch at noon every Tuesday and are encouraging members and potential new members to take part. Contact Missy Kendrick with the Rotary Club at 770-584-5234 for more on how to participate or become a member. Annual dues are required to be a member. The Sit and Stitch is back to sewing at Rockmart First United Methodist Church in the fellowship hall. The group will meet the first and third Monday's of each month from 10 a.m. to 2 p.m. Participants can bring any craft they choose or help with a ministry project this year. The group is making crochet or knitted caps for donation to Helping Hands. A pattern will be provided and the group has crafters who can help those in need of instruction. Bring a sack lunch. Coffee or tea provided. Any questions please call Madeline Brown 678-435-5032. The Kiwanis Club of Cedartown encourages members to take part in weekly meetings on Fridays at noon at the Cherokee County Club. Potential new members are asked to get in touch with Rhonda Heuer, Club Secretary at 770-748-1016 to learn more about how you can take part in making the community a better place. Annual dues are required for membership. Visit kiwanis.org to learn about the club. Check out the Rockmart Farmers Market at the Silver Comet Trailhead behind Southcrest Bank on Thursdays from 2 to 6 p.m. Visit Rockmartfarmersmarket.com for details about vendors and upcoming classes. The Church of Jesus Christ of Latter Day Saints provides opportunities to local residents interested in hearing the message of Jesus Christ. For more information about how you can speak to local Elders, contact 687-852-7497, or visit their meeting house at 10005 N. Main St., Cedartown for worship services at 10 a.m. on Sundays.